Reclaimed wood can be used to produce beautiful wood flooring in your house and at the same time contributing to the green effort for recycling. You can build reclaimed wood flooring by yourself or use one of the companies that are selling this wonderful product to achieve gorgeous floors. You can also reduce landfills waste, save living trees and even bring a piece of the past into your home. Here are some methods on how you can build flooring with reclaimed wood. You can get your reclaimed wood from many sources and places. Old barns, siding old industrial sites, boxcars, vintage houses, wine casks, decking and all sorts of historical structures can be suitable resources to recycle reclaimed wood. Aged wood has its own texture, color and patina that cannot be imitated by new wood. Each piece is unique and has its own character. For example, the Logleaf heart pine comes from buildings built from 300 to 400 years old during the Industrial Revolution. One characteristic that matches all of reclaimed wood is that they are from structures that have been built from our past and being down. The wood of the structure is slated to be discarded. You need to use healthy and sound wood to build a solid floor. Most of the wood is not only aged but also comes from stronger and straighter trees. However, in some cases such as the American chestnut, this wood is no longer available. Available woods that you can search for are the top quality poplar, oak, beech, chestnut and hickory. Certification will be included by many of installers that tell you about the wood\’s origin and all about the history for you to preserve. You not only own a part of history and get a floor with outstanding beauty but at the same time, rescuing this vulnerable old wood from dumped into the trash heaps. 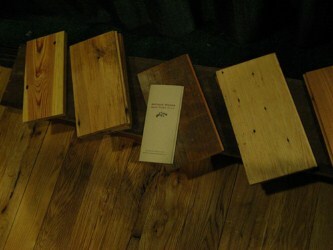 Reused wood is a bit more costly than regular new wood. So be prepare to spend more on reclaimed wood as the cleaning and preparation of the wood is labor intensive. But you can save yourself a lot more if you build the floor yourself and wiling to buy less finished reclaimed wood. Other alternatives that you can do to save budget is to find demolition area which the wood is readily available. The prices are tending to be much lower. This entry was posted in Floors, Home Improvement on April 3, 2010 by Mike.